Red-faced and breathless, I find myself negotiating yet another of the capital’s steep, cobbled laneways, hoping to stumble upon the city’s famous Monserrate cable car, an attraction that whisks visitors 500 metres above the city. The fact that Bogotá already sits atop a hulking montane savanna, at an altitude of 2,600 metres, was something I had grossly neglected to consider – and I was feeling the altitude. After a rocky cable car ride, and with each breath nearing a wheeze, I pause on the steps of a 17th-century church perched on the mountain. At this elevation, I couldn’t feel further from the oppressive swell of the city. And the city couldn’t feel less significant. Despite its sprawling nature, the capital is dwarfed by its surrounding mountains, plateaus and savannas; each painted in a different shade of green and observed by an eternally blue sky. For a country plighted by conflict and bloodshed through the years, it’s a view that represents a world of peace and possibility. Beyond the confines of the city, it’s my first true glimpse of contemporary Colombia. It’s also the first image that comes to mind when speaking with chef Leonor Espinosa, at her famed Bogotá restaurant, Leo – ranked number 18 in Latin America by The World’s 50 Best Restaurants 2018. “Colombia has great potential on an international scale because of our incredible biodiversity. From our oceans to our rainforests, there is a world of culinary discovery at our fingertips,” she says. Better known as Leo, the internationally acclaimed chef is more than qualified to comment on Colombia’s culinary potential. Not only was she recognised as one of Colombia’s 20 best leaders in 2015, and as Latin America’s Best Female Chef 2017, but she is an on-going advocate for preserving food traditions, local production and sustainable practices through organisations like the Leo Espinosa Foundation (FUNLEO). This insatiable desire to work closely with local farmers and producers across Colombia, while demonstrating a passion for ancestral techniques, is mirrored in her 16-course taster menu, aptly dubbed “Ciclo-Biome”. I am sampling the menu at the chef’s trendy, minimalist flagship property in the upmarket Centro Internacional district of Bogotá – an area where sharply-dressed business people rub shoulders with Latin America’s A-listers. Taking a seat in the bright, modern restaurant, my dining partner and I are expertly guided through the menu by maître d’ and head waiter, Jerson, who offers a succinct and practiced description of each course. It is soon apparent that a story is being told; the dining experience doubles as a geographical gastronomic exploration of Colombia. From the exotic arazá and camu camu fruits – sourced sustainably from the country’s tropical rainforests – to Amazonian black pepper, ponche (wild rodent meat) and caiman from rural wetlands, each dish is a celebration of its origin. The fare is stunningly aesthetic; something that Leo, with a background in contemporary art, is deliberate about. In her eyes, presentation is as important as taste. Standout dishes include indigenous limonero ants, served with yoghurt cheese and native potato, local duck meat with corn flatbread and succulent seasonal white fish with páramo leaves and copoazú. There’s a hint of the traditional in every course, but it remains a world away from the comparatively bland and unimaginative ajiaco (potato and corn soup), arepas (corn cakes) and aborrajado (fried plantains with cheese) that the country has become known for. 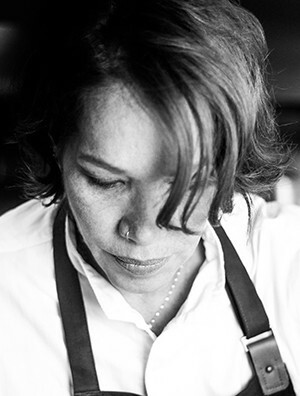 The idea of balance and changing mind-sets is not only apparent in the culinary explorations of Leonor Espinosa, but represents a much broader socio-political shift in Colombia. For a country once held hostage by aggression and warfare, times are changing. And with this change comes a new wave of experimentation and expression, in everything from music and art to fine dining. It is the likes of Leo that lead this charge, and I have little doubt that the mantle will be assumed, and further innovations inspired, by her example.